This post is for the June blogchain through Absolutewrite. It doesn’t have a theme which makes it a little easier for me since this blog is specific to Florida. The topic started out with Global Warming and moseyed through personal responsibility and corporate waste. Forbidden Snowflake then wrote about national disaster for her country Switzerland and would the EU help if their economy collapsed. So I thought talking about hurricanes that affected Florida would be great because nothing effects a state like a national disaster. Great Miami Hurricane 1926: During the Roaring 20’s in the United States Florida was having a land boom. People were buying lots of land sight unseen. If you’ve ever heard the phrase, “Yeah, and I have some land in Florida I want to sell you.” This is the time period it comes from because it was unbelievable. If you ever tour the everglades you might still come across a sign that might look likes the one to the right. ” Edit Resource for “Photographs depicting Seminole Indians with dugout canoes, 1920-1928 (bulk 1920) [electronic resource] “”] Land in Miami and all over Southern Florida was being bought up. Every bubble bursts and the land boom ended in 1925 and came to a complete standstill September 18th, 1926 with the arrival of a category 4 hurricane whose eye was directly over Miami. This hurricane caused $90 billion dollars in damaged if it had hit Miami today. 800 people went missing along with 373 deaths and 6,381 injuries. It proved to non-Floridians who were the ones most likely dead, missing, and injured that Florida was a dangerous place to live. Since most of these folks left shelter when the eye took half an hour to pass over Miami leaving many to believe that the storm was over. Their unfamiliarity with hurricanes was the death blow of Florida’s land boom. The Great Depression was soon to follow but most of Florida was already there in 1929. This storm does not have a name because hurricanes and tropical storms were not given names until 1953 and they were all female until 1979 when the National Weather Service began alternating between male and female names. Florida Keys Labor Day Hurricane 1935: On September 2, 1935 a category 5 hurricane ripped through the keys leaving 408 dead and $6 million in damages. Flagler’s Miami/Key West line of the railroad was so damaged that it was sold to the state. Most of the deaths from this unnamed hurricane were World War I veterans. Built the Miami/Key West line of the railroad that later became known as Flagler's Folly. They were part of the Bonus Army that first visited the White House when Hoover was in office to demand the bonus they were to recieve in 1945 early. They were chased away from the White House but later brought their greivances to FDR. He enlisted them in the WPA and gave them work building a bridge from the mainland to the keys to replace the ferry service that was in current use. Due to red tape, confusion, and a lack of communication the evacuation of the veterans by the train was delayed and overturned by a tidal wave during the hurricane. The World War I veterans who were only given temporary shelters that could not withstand a hurricane were lost. As you cross the 7-mile bridge, also called the overseas highway, you can still see what remains of Flagler’s Folly. 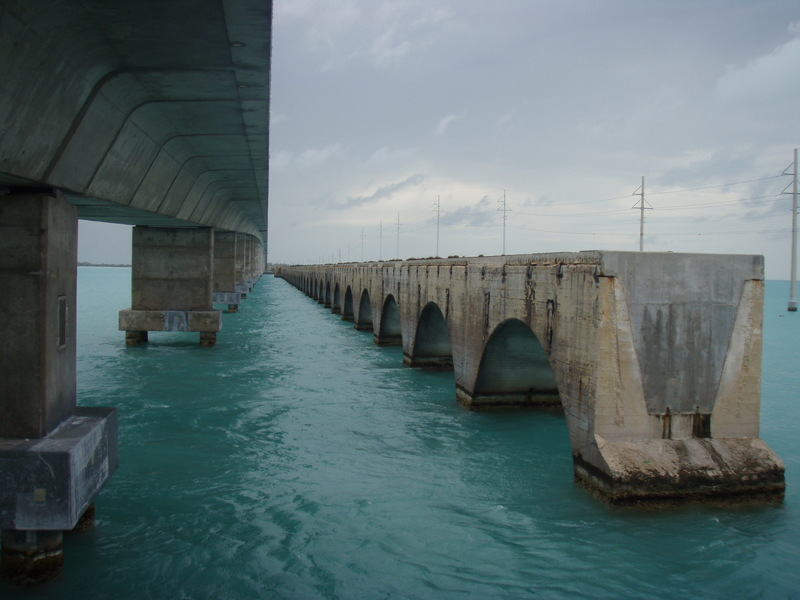 Two bridges on the w:Overseas Highway within the Florida Keys. The bridge on the left is the modern highway bridge, while the bridge on the right is the original bridge built by the Florida East Coast Railway, retrofitted to automobile traffic after 1935, and later closed. Please visit their blogs and leave a comment. Very interesting post. Someday I must get to the Keys. They sound really interesting. Wow, it seems that Florida has a lot in common with Bangladesh. The only difference is perhaps that we call them as cyclones instead of hurricanes. In the last two years, we had two devastating cyclones and many people died. Fortunately, I live in the capital city and do not touch them like the people living near the costal areas. Stamperdad- The Keys are really fun. There is the Earnest Hemingway house with his six toed cats and Sloppy Joe’s restaraunt. There is also Mallory Square. I haven’t been there in ages but I hope to go back sometime soon. Razib Ahmed- Yeah, we haven’t had a hurricane hit Florida in a while. I’m like you even though I live on a coast it’s the west coast which doesn’t get hit as often as the East coast does. Very interesting post. We don’t have weather problems over here, no Tornado, no Hurricanes and no earthquakes, it’s always interesting to read about countries that are affected by such disasters. At least with hurricanes and modern weather tracking we can get 3 or 4 days warning. Don’t you have to worry about snow related disasters though? I live inland, in South Carolina, so I don’t have to deal with hurricanes. We do get people evecuating if they hit Charleston. What I don’t understand is the people who refuse to leave when they do get a warning. Do they think they can save their house by staying? It will survive or not, but staying in it will not improve the house’s odds.